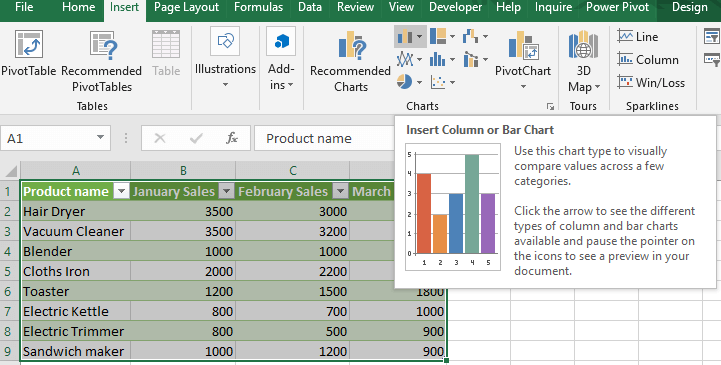 Creating charts is one of the main purposes for which you use Excel. The different kind of charts gives us the visual representation of the data we are working on. 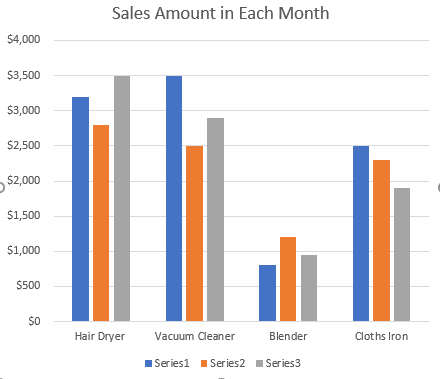 In this article, I will show you how you can create a chart from the selected range of cells. There are many ways of doing that. We will cover all the processes in this article. 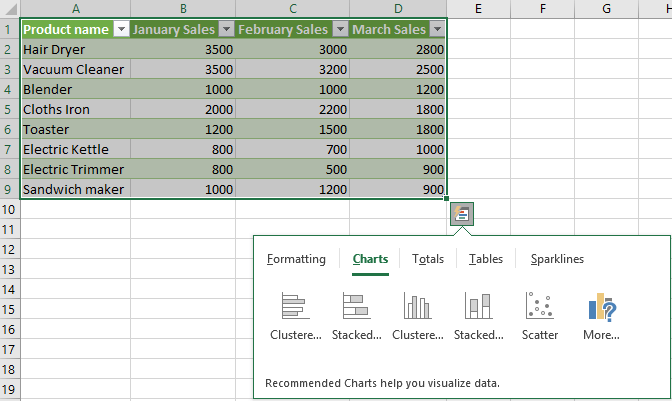 Normally while creating a chart you select the whole range of cells of your table. Before creating any chart, you create a table from which you can create a different kind of charts you want. In this process creating a chart is very easy. After making a table select all the cell of your table while pressing the left button of your mouse. Then press on to the Insert tab and in the Charts section, select any chart you want. You can also insert the charts by selecting the range of cells and then clicking the right button of your mouse to select the Quick Analysis option. 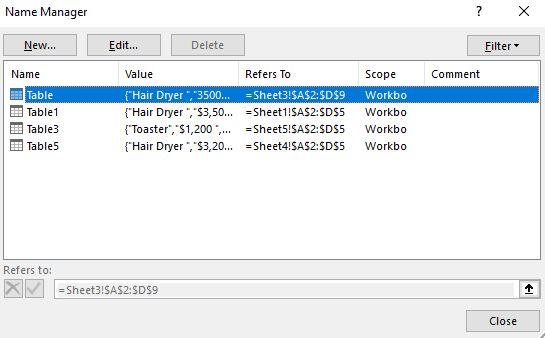 After clicking the Quick Analysis option, you will see the Carts section. Here you can select any charts you want. You will get to see the chart in your worksheet by applying any two of these methods. 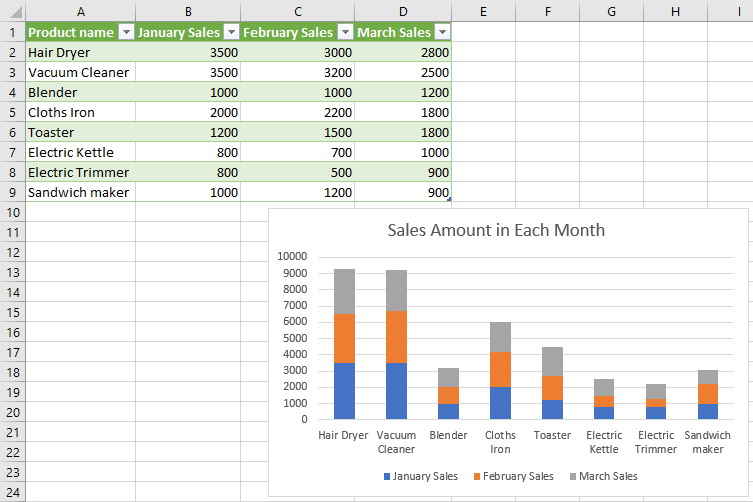 Instead of selecting the cells/table manually with your mouse you can select the whole table from the Name Box and create the chart that you want. For this just press onto the Name Box which is located on the left side of your Worksheet. 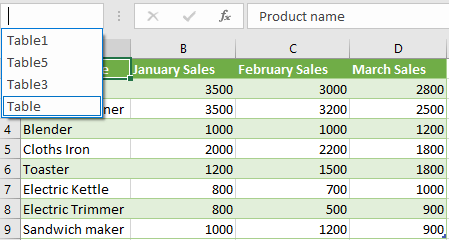 If you didn’t create a table but want to create a chart for various data, you can create Name Ranges. Both the Name Ranges and Tables can be found in the Name Box. To create a Name Range first select the Formulas tab and then in the Defined Name section select the Name Manager. Now after clicking on the Name Manager, you will find a new dialogue box. Here you can create a new Name Range. To create a new Name Range, select the New option. In the New name dialogue box impose a name along with the range for which you want to create a chart. After this press OK.
Now you will find this Name Range in the Name Box. After selecting the Name Range from the Name Box you will see that all the cells of this Name Range are selected. When it gets selected you can then follow the same steps stated earlier to create any chart you want. Note: Whenever the chart is created you will see the new chart name in the Name Box. So, don’t be confused if you see this. With the help of Name ranges, you can even create new charts in an existing chart. For this, select the existing chart and then click on to the Design tab to select the Select Data option under the Data section. Suppose you want to create a chart with the available information of a Name Range. Let’s choose a Name range named Table5. 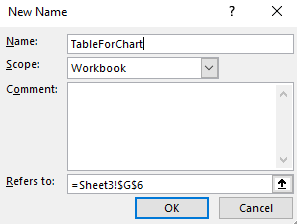 In the Select Data Source section, write =Table5 and then press OK.
Now you will see a new chart in your worksheet which is different from the previous one. 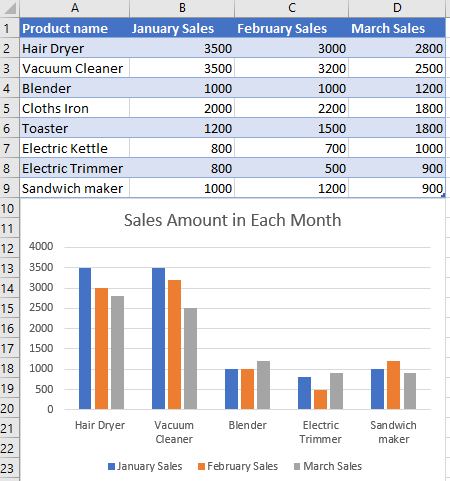 Suppose you have a table from which you want to create a column chart. The Table consists of some product names. You don’t need some of the product information in your chart. The question arises what can you do? The answer is very simple. In this case, don’t select the information of those products which you don’t want show in your chart. In my case, my table consists of 8 product names. I want to create a chat with 5 products. So, I will only select all the relevant information for the 5 products. The information on the 3 products will not be selected. As you can see the information of the products Cloths Iron, Toaster and Electric Kettle are not selected. 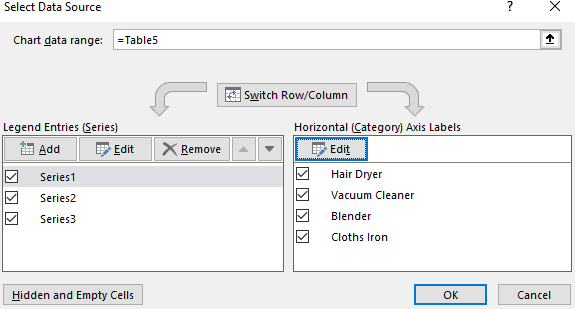 So, after selecting the rest 5 products with the headers if you follow the procedure for inserting a chart you will see that only the selected products information will be shown in the chart. 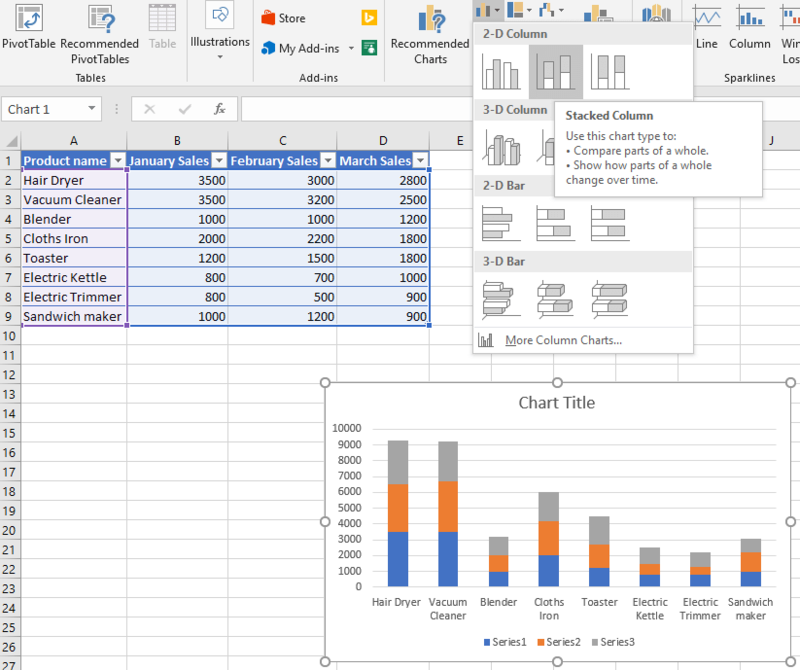 I hope after reading this article you will surely learn the process of creating a chart in a worksheet by selecting a range of cells. Follow us for getting more useful articles like this one. If you have any query place it in the comment box below. Very good, it help me a lot.